The Bay Area LGBT Islamic Center pioneered many elements now commonplace in mosques including dazzling spinarets and a "Disco Dome" however it's still vandalized on a daily basis. SAN FRANCISCO, CA – It’s been nearly five years since the controversial opening of the Bay Area LGBT Islamic Center, commonly abbreviated as BALGBTIC. After initial firestorms of criticism and angered picketing, things have recently quieted and worshippers have settled into their routine. 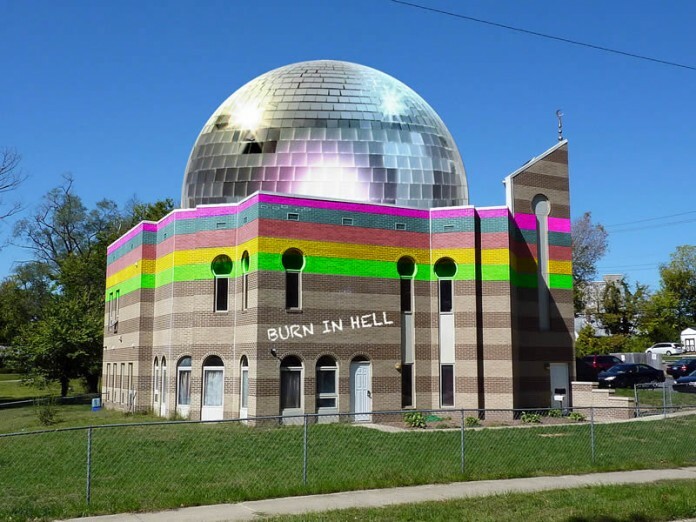 And while many have grown accustomed to hearing “fabulous fatwas” or driving past the center’s “Disco Dome,” the LGBT Muslim community are cognizant of how far they have yet to go. Immediately thereafter, all eyes were on Saleem as he stared and smiled, seemingly unable to blink. Many are questioning if Saleem understands English or might be a spy for straight Muslims. Others ponder if he’s blind, deaf or perhaps in subconsciously “in the closet” himself.